Last year, Ellesmere College resurrected their traditional attempt at the Welsh 3000s (or 15 Peaks). It’s a challenge that involves standing on all 15 of Wales’ 3000ft mountains within a 24 hour period and, due to the geography of it all, it’s all done on your own two feet. This year’s group was made up of two boys that had been in the College team last year, my son (who also completed the challenge last year on a separate occasion) and one lad that was new to it. Three others had originally asked to take part but pulled out for various reasons, so it turned out to be a very select crew. Having crawled out of our tents in Capel Curig at 3am, we got to our start and were ready to start walking by 3.35am with just enough light not to need our head torches. We slightly altered our route up to Crib Goch from last year, staying further to the right, which made for easier going and we made it to the top for 4.50am. From here on, the ‘official’ clock was running, but we were more interested in completing the task within 24hours than going for the best time possible. 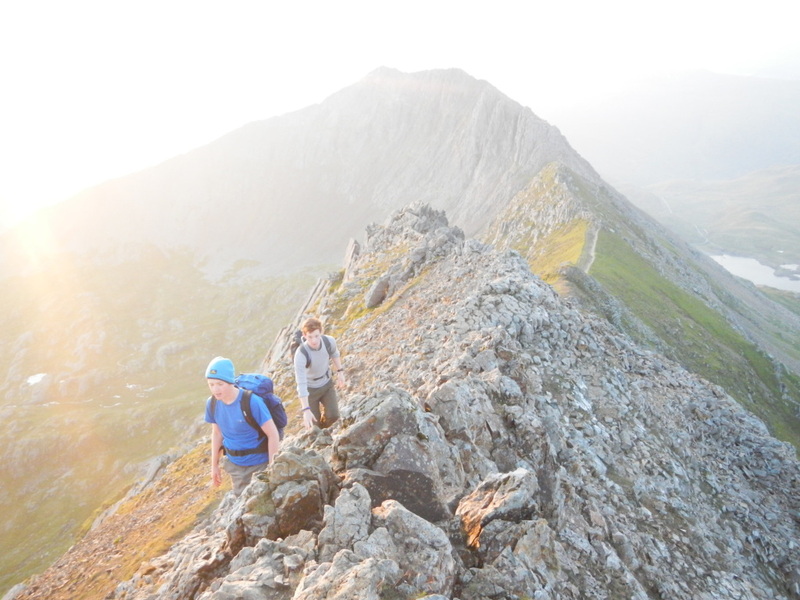 Our traverse of Crib Goch was fantastic, with the sun starting to rise over the horizon. We passed 3 groups, also attempting the 3000s, heading the other way and seemingly much more intent on making quick progress. Having taken in the the top of Garnedd Ugain, it was just passed 6am when we reached the summit of Snowdon itself. Heading down the Llanberis Path, we made the decision to dive off right, down to the road, from Clogwyn Station. It was awkward going for a while, but saved a huge amount of time compared to last year and we were having breakfast in a lay-by by 7.50am. I had the luxury of having a second instructor on the challenge, who met us for breakfast and took over from me for the second section of the challenge over the Glyderau. They were on there way again by 8.35am, starting the long trudge up Elidir Fawr which the managed by 10.20am. They made good time over the Glyerau, reaching the 5th peak of the section by 2.40pm and getting back down to the road for 3.50pm where I was ready and waiting with dinner. My son had always said that he would withdraw at this point. With his leavers’ prom the next night, he didn’t want to be too tired to enjoy it. Unfortunately, one of the other lads (the only one not to have completed the challenge before) had to pull out after his boots started to disintegrate. So I set off with only half the group from Llyn Ogwen at 4.30pm as we powered our way up Pen yr Ole Wen, reaching the top by 5.50pm. Once up on the tops again, there was a definite sense of relief and, as we made our way across to Carnedd Dafydd, the pace started to turn into a brisk walk. After Dafydd, the pace quickened further. It may have been the realisation that we were catching the group of regular soldiers that spurred them on, but we were really motoring. As we passed the soldiers, I couldn’t help pointing out that these cadets were showing them up – they didn’t look too happy about it! 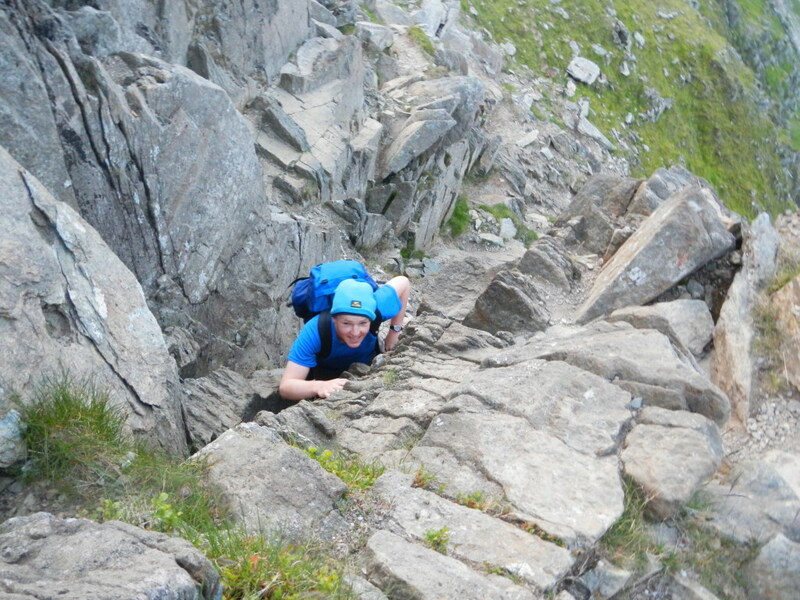 We skirted round Carnedd Llewelyn to get to Yr Elen first at 7.05pm. This was another change to last year, and one with worked in our favour. Coming back across to the top of Carnedd Llewelyn made navigating off again much more straight forward than it had been last year. The boys had been told that 17 hours was a good time for the challenge, and were keen to make the grade. So, as we approached the top of Foel Grach,I reminded them that they had 2 hours left to make their target. Although I’d expected this to encourage them to keep the pace up, I hadn’t quite expected the amount of running that followed. 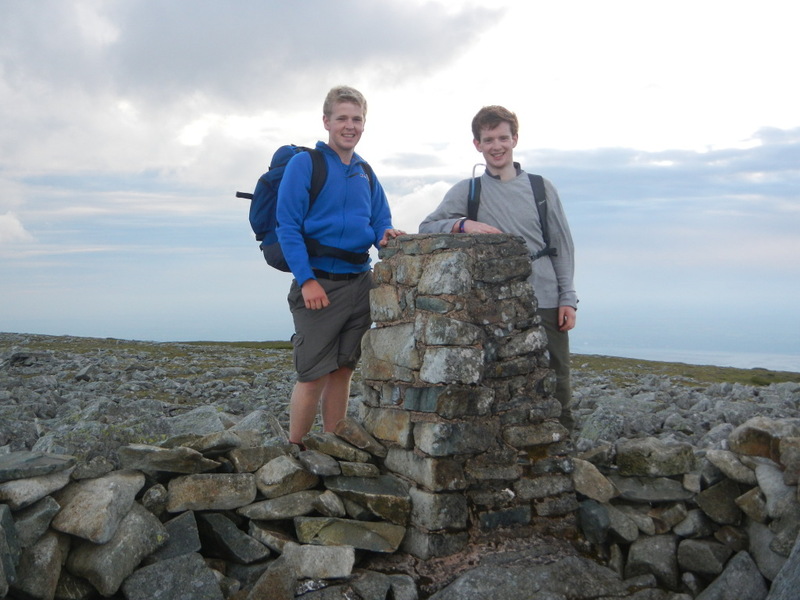 We made it to the next peak (Carnedd Gwenllian – formerly Garnedd Uchaf) in only 17 minutes, and reached the final peak, Foel Fras, in another 17 minutes. This gave them a total challenge time (first peak to last peak) of 15 hours and 39 minutes. The time was fantastic, especially the fact that they got from Llyn Ogwen to the end in just 4 hours. With the pressure off, we made our way down to the north, reaching our pick up point at 9.45pm with daylight to spare. Last time I did this challenge, by the time I reached the pick up point the sun had gone down and come back up again. This year’s attempt went so much better than last year. We made several small, but significant, changed to the route which saved time. The other thing that this year really showed, was just how much quicker you can move in daylight. Congratulations to the Jo and Mark for completing the Welsh 3000s challenge for the second time, and for doing it so quickly. My commiserations go to Peter, who will be looking for new walking boots this weekend. As for Alfie, I hope that he’s not took tired to enjoy his leavers’ prom tonight.